I accuse Vice President of the European Commission Frans Timmermans of unjustifiably reinforcing an atmosphere of resentment against refugees, by deliberately making a largely incorrect statement “that about 60% of the refugees which enter the EU are in fact economic refugees and no victims of war”. By doing so, Frans Timmermans helped to spread a false picture that a 60% majority of the refugees are ‘economic fortune seekers’, which are not entitled to seek refuge in the European Union. Timmermans’ statement was based on December 2015 data of Frontex alone, which has not been published yet and therefore cannot be checked by the general public. Even though Timmermans’ interpretation of the Frontex data could theoretically be true, it is absolutely not in line with data that has been published earlier by Frontex, regarding Q2 and Q3 of 2015. 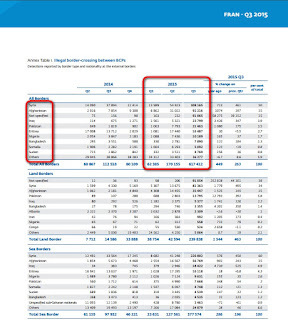 And even though it is in line with the Frontex data of Q1, the influx of refugees during this particular quarter was minute, in comparison with the later quarters of 2015. Therefore it seems that Timmermans’ statement is not true and thus unjustified and needlessly polarizing. In the current explosive atmosphere of (violent) resentment against refugees in The Netherlands, Germany and many other European countries, such an incorrect statement is obviously condemnable and dangerous. Two days ago, the Dutch European Commissioner and prime Vice President of the EC Frans Timmermans made a bombshell statement in an interview with the Dutch public broadcast organization NOS, as he stated: “More than half of the people now coming to Europe come from countries where you can assume they have no reason whatsoever to ask for refugee status. More than half, 60%”. More than half the asylum seekers coming to Europe are not fleeing from war and northern Africans in particular are leaving their home countries for economic reasons, the Netherlands’ European Commissioner has told the NOS. Many public media and newspapers printed this news unthinkingly and without checking this particular statement, as it was an important statement – a genuine bombshell – made by one of the highest ranked persons in European government circles. I, however, had serious doubts about the figures mentioned in this message by Frans Timmermans, as a number of 60% of refugees being economic refugees seemed much too high. 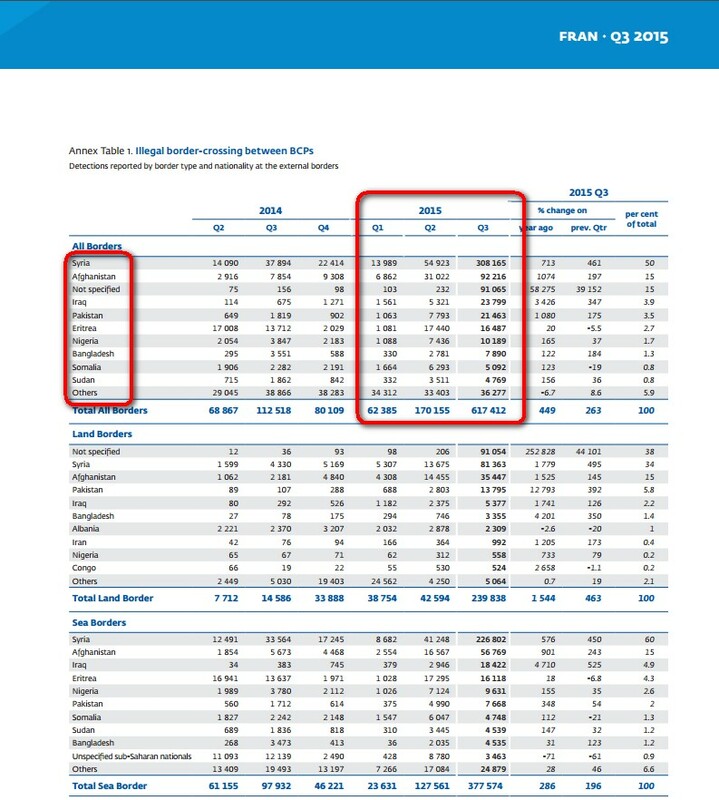 Therefore I checked the latest available data by Frontex, which happened to be the 2015Q3 data (later dated data is not yet obtainable). Still, the December data of Frontex, that Frans Timmermans claimed to know, could indeed confirm the statement of this prime vice president of the European Commission after all. However, over the first nine months of 2015, more than 57% of all refugees were refugees fleeing for war in their home countries and not economic refugees. This 57% is not even close to the 40% that Timmermans claimed. Therefore I accuse Frans Timmermans of a. deliberately spreading a doubtful picture of the refugee situation in the European Union and b. of doing so in a time in which the (sometimes already violent) tensions regarding refugees are mounting in many European countries, including his home country The Netherlands. Whether this statement was made out of personal vanity and urge to score a bombshell statement in the leading European newspapers or out of real concern about the refugee situation, is not important in this matter. It is a false picture and therefore I condemn his statement. Frontex does have data about 2015: 880,820 migrants came to Europe via ‘the Eastern Mediterranean sea route’ (i.e. via Turkey with a boat to Greece). The Top 3 of nationalities: Syrian (494,103), Afghani (212,721) abd Iraqi (90,917). Countries in which there is (partially) a war. In December 2015, 108,000 migrants came to Greece, according to Frontex, but this figure cannot be divived into nationalities yet. The IOM, the world’s biggest organization regarding migrants, does not recognize the picture of Timmermans regarding December. As a matter of fact, IOM possesses data over January: “ Between 1 and 25 January, 45,361 migrants arrived in Greece. The largest groups: 16.318 Syrians, 9825 Afghans, 4801 Iraqis and 1140 Iranians“, according to a spokesperson. On request he looks at the number of Moroccan and Tunesian refugees: 104 and 105. The IOM receives the data from the Greek authorities. This statement by Timmermans’ spokesperson is as close to telling ‘that Frans Tîmmermans made a mistake without really telling that Timmermans made a mistake’ as humanly possible. My personal take is that Timmermans blatant vanity and scoring instinct forced him to make an unjustified and foolish bombshell statement that could easily be debunked by just checking the available Frontex data. That many Dutch media failed to do so, because this statement by Timmermans confirmed their own prejudices and opinions, is at the expense of those media alone. I, as publisher of Ernst’s Economy for You, rather let myself being led by the sheer data.